As we continue to address the numerous issues related to Windows 10 on our portal, one cannot help but wonder how Microsoft managed to get so many bugs in a single upgrade. While some users have complained about the missing audio services after their upgrade, there have been complaints where users haven't able to detect the taskbar. This "taskbar disappeared' error has been questioned on my forums. While Microsoft has promised updates in order to resolve the issue, users are looking for options that can remove the "taskbar disappeared' error. 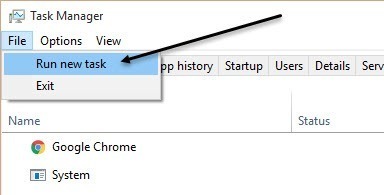 In the given article, we shall look for methods to address the "taskbar disappeared' error. Let us now address the other reasons that might be causing the "taskbar disappeared' error in Windows 10. It is possible for your taskbar to be hidden. However, once you move your mouse to the bottom of the screen, you can expect it to show up. If there is some unforeseen error, you are required to turn off the auto-hide and get rid of the "taskbar disappeared' error. Simply right-click on the Taskbar would be one's obvious choice, but in this scenario, you would have to access the Control Panel, and click on "taskbar and Navigation'. 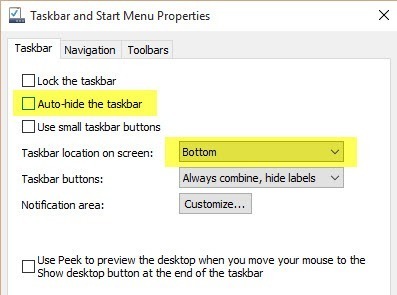 This helps you view the taskbar properties dialog box and here, you are required to uncheck the "˜Auto-hide the taskbar' box. Often, there are instances when the auto-hide on the left or right of the screen and is missed by the user. Before undertaking the troubleshooting techniques, users should check for that as well. For the ones who regularly connect their computer to external display options like an LED TV or docks, the issue of "taskbar disappeared' could be arising because of that. To eliminate the error, all you have to do is press the combination of Windows key+ P or move to the control panel, choose "˜Display' and finish by clicking on "˜Adjust'. For the users who have been using Windows 10 after an upgrade, the resolution and display settings and quite the same with the same options popping out from the right side of the screen. 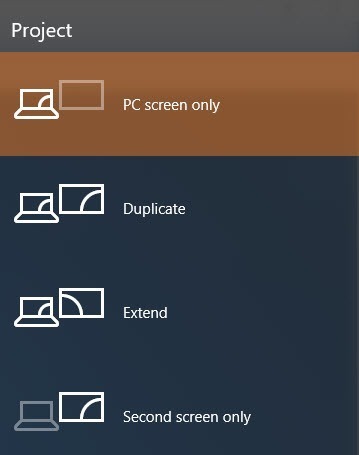 If you are using Windows 10, you might only be interested in "˜PC screen' option. If the "taskbar disappeared' option was related to this issue, the above procedure ought to solve it. If nothing else works for you, this procedure should do the trick. It is important to note that Explorer.exe is a process that is responsible for controlling the desktop and taskbar. 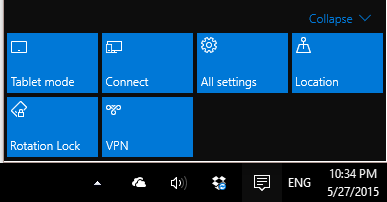 It's not only the taskbar that is missing, but also the icons that often go missing. Since both of them depend upon explorer.exe, they both are not found at the same time due to the error. 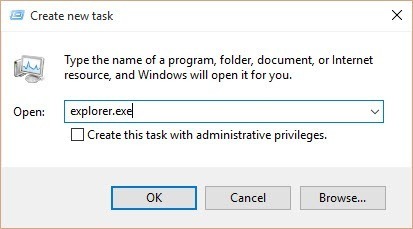 You now have to open you "task manager' in Windows, and type "˜exploer.exe' and then press Enter. The explorer process would be restarted, and this will let you have your taskbar back. For the ones who are seeing a Windows explorer popup, it merely signifies that the explorer.exe process was already running in the background. Users don't have to feel alarmed by the consistent issues they have been facing with Windows 10. As a new Operating System, it is bound to have its own issues which can be resolved with help from Microsoft which has been striving to enhance the user experience. There were also reports during the Windows 10 Technical Preview build of static and some other minor issues causing problem with the sound driver and even the HDMI ports. 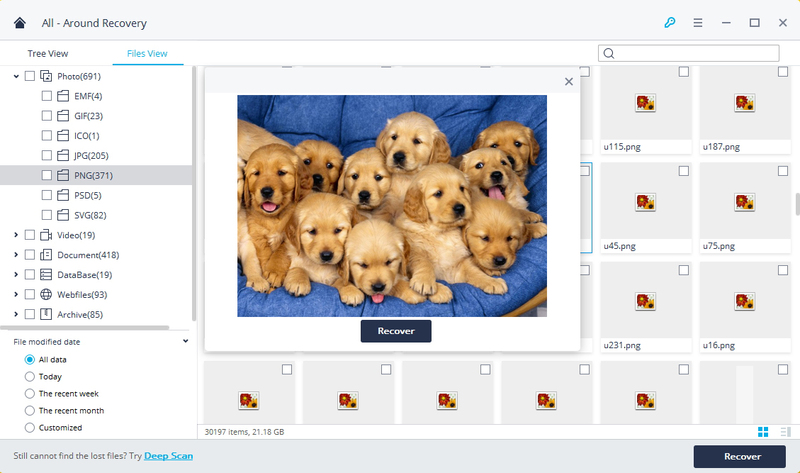 While users tried to solve the issue of no sound on computer by using multiple third-party applications, regular updates were released in order for the issue to be resolved. One of the many reasons for you to witness "taskbar disappeared' error is that you haven't yet figured the difference between the tablet mode from Windows 8 and desktop mode in Windows 10. This section helps you understand the difference. One can be optimistic that Microsoft would soon release a version that would address the issues in Windows 10 and the error of "taskbar disappeared' won't occur anymore. The system switches into the tablet mode itself, leaving the users confused as they are unable to access their desktop or taskbar with all the icons missing. The only resort left in such a situation is to restart the device in the hope of overcoming the "taskbar disappeared' error. Therefore, if you ever face the situation where your desktop or entire taskbar goes missing, thus popping up the "taskbar disappeared' error, there won't be any reason for you to panic. 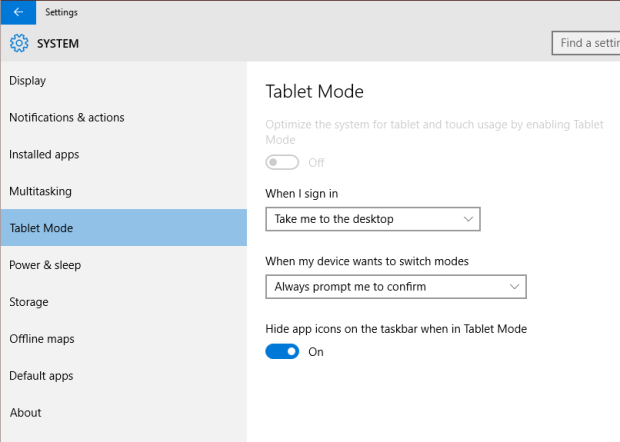 Simply disable the tablet mode using the above instructions. 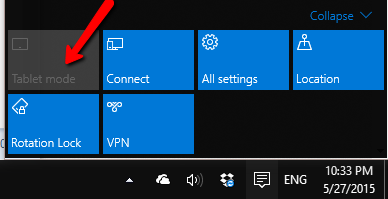 For the ones who have resolved the "taskbar disappeared' error using the above techniques, we advise you to go through other articles on the portal that discuss the numerous troubleshooting techniques in Windows 10. With all its upgrades and faster boot time, Windows has indeed changed the way we saw Operating Systems. Don't let yourself be confused by the tablet and desktop mode, and find a solution to your "taskbar disappeared' error from the given article.